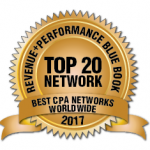 These are the current Blue Book Top 20 CPA Networks, as chosen by the advertisers and publishers of the world-wide performance marketing community. Scroll down to view the Top 20 CPA Networks 2015. Go to Website Clickbooth is a respected industry veteran celebrating 15 years in the business. Client success stories secured them the top spot. Go to Website Consistently one of the favorites of our voters, MaxBounty runs on great leadership and a solid reputation. doing a lot of things right. Go to Website Experience tells, and for W4 that means a steady rise up the rankings. A good, solid, professional network. Go to Website Madrivo ranked highest in Affiliate Satisfaction, leading the charts with the most exclusive offers from large US brands as well as analytics based on real-time data. Go to Website MUNDO Media, one of several Canadian networks, remains a strong contender. With its’ proprietary technology it has grown quickly across several verticals. Visit Website Moving up the ranks, Affiliate Crossing continues expanding its global footprint. It continues on its path of integrated branding, search engine marketing and social media marketing. Go to Website The inventors of Content Locking, half a million affiliates and way up in the Inc. 500, CPAlead is deservedly rising fast in our rankings. Go to Website AWM is particularly strong in Content Locking and run on their own proprietary platform in order to deliver a great publisher experience. Go to Website Tom Dietzel is well-respected, built his own tracking platform, and his affiliates rate CPAWay highly – that’s all that needs to be said. Go to Website Matomy has seen amazing growth and is now an worldwide behemoth with amazing capabilities. If you need reach, Matomy is your network. Go to Website Based out of Québec, Canada, CrakRevenue is an established network with a growing reputation. Very solid. Go to Website 24/7 service, great staff and an international focus, Above-All-Offers is the best network we know in Oregon. Go to Website A San Diego-based network, A4D is aggressive, smart and has a loyal band of publishers. Go to Website A data-driven digital marketing leader providing premium media solutions to the world’s leading brands and agencies. Go to Website A popular network that is known for their Content Locking and Offer Wall platforms. Go to Website Nutryst is a fairly new private affiliate network focused entirely on nutraceuticals. Entry is restricted to students or by referral. Network rankings have a tie for 1st place. MaxBounty wins this year for their consistent quality, longevity and experience. Received high votes in all categories. After chasing the #1 spot for several years, Chad French’s network has finally made it. Loved by publishers for their strong affiliate management team. Being acquired by GlobalWide Media a year or two back hasn’t slowed down Neverblue at all. Another very strong showing. Clickbooth seems to have been around forever. Lots of scale but just a fewer votes across the industry than the top two networks. One of the several Canadian networks in our Top 10, Mundo Media is growing fast across several verticals using proprietary technology. The content-locking kings, Adscend has terrific reach. If you want to monetize content, look no further. Another impressive rise in the rankings this year, Above All Offers in based in Eugene, OR, but serves clients all over the world. Matomy is rapidly expanding via acquisitions and strategic partnerships, transforming itself into an international behemoth. Tom Dietzel is well-respected in the industry and is known for new technology initiatives. A good, highly professional network with one of the most experienced teams in the industry. Jumped one place from last year. Still a strong network with good offers. Another new entry and international network, ClickDealer has quickly made a name for themselves by rapidly becoming a certified Google Partner. Formally known as Affiliate Venture Group this network has re-invented itself and they are very excited to unveil their new brand.